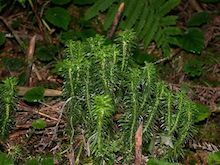 Huperzine A comes from the club moss Huperzia serrata (shown) and is available as a dietary supplement. While it is beneficial in mouse models of epilepsy, huperzine A is not FDA-approved and clinical trials are necessary to assess safety and efficacy. Photo from Wikimedia. The compound huperzine A can increase resistance to induced seizures in mouse models of genetic epilepsy, scientists at Emory University School of Medicine have found. In particular, huperzine A shows potential for protecting against febrile seizures, which are a feature of both Dravet syndrome, a severe form of childhood epilepsy, and a related condition, GEFS+ (genetic epilepsy with febrile seizures plus). The findings were recently published in Frontiers in Pharmacology. Huperzine A comes from the club moss Huperzia serrata and has been used in traditional Chinese medicine. The compound has been tested for the treatment of inflammation and neurological disorders, including Alzheimer’s disease and schizophrenia. Children with Dravet syndrome experience early-life seizures due to high fever as well as other types of seizures and developmental delays. Although the condition can be controlled with some antiepileptic drugs, most patients do not achieve adequate seizure control. Most cases of Dravet syndrome are caused by “de novo” (not inherited) mutations in a sodium channel gene called SCN1A. The channel allows sodium to quickly enter into the cell, and forms part of the molecular machinery that is critical for how an electrical signal forms and travels along a neuron. In Dravet syndrome, the mutations often inactivate the gene, while SCN1A mutations in GEFS+ change properties of the sodium channel without inactivating it completely. Both types of mutations lead to increased neuron excitability. “We think that huperzine A could normalize the balance between neuronal inhibition and excitation in patients with SCN1A mutations, thereby protecting against seizure generation,” says senior author Andrew Escayg, PhD, associate professor of human genetics at Emory University School of Medicine. At Emory, Escayg and his colleagues have developed mice in which one copy of the SCN1A gene has been modified as mouse models for the study of Dravet syndrome and GEFS+. Co-first authors of the paper are postdoctoral fellow Jennifer Wong, PhD and Stacey Dutton, PhD, now an assistant professor of biology at Agnes Scott College. Scn1a mutant mice exhibit increased susceptibility to seizures induced by hyperthermia, which serves as a model of human febrile seizures. In the Frontiers paper, almost all Scn1a mutant mice exhibited a seizure when their core body temperature reached 40°C. In contrast, when the mice were pre-treated with huperzine A, they only experienced a seizure at significantly higher temperatures. Escayg’s team also found that huperzine A can reduce the frequency and severity of electrically and chemically induced seizures, both in normal mice and in SCN1A-mutant mice. In these experiments, the scientists observed that the protective effect against electricity-induced seizures in normal mice diminishes after 12 days of daily huperzine A administration, but “complete protection” is maintained in the SCN1A-mutant mice. “The protection observed in normal mice suggest huperzine A might also increase seizure resistance in other forms of treatment-resistant epilepsy. While these results are encouraging, further research will be required to determine suitability of using huperzine A as a clinical treatment for epilepsy,” Escayg says. Biscayne Pharmaceuticals has plans to begin a phase 1b clinical trial of huperzine A in adults with refractory complex partial epilepsy in 2017. Clinical studies in children with Dravet syndrome are planned after additional toxicology studies are performed, as required by regulatory authorities. Huperzine A is thought to work, in part, by inhibiting the enzyme acetylcholinesterase, which breaks down the neurotransmitter acetylcholine. Thus, huperzine A can increase the levels of acetylcholine in the brain. In mice, the scientists observed some transient side effects from huperzine A administration: hypothermia, muscle twitching and lethargy. However, they determined that hypothermia does not contribute to seizure protection. Previous clinical studies have reported side effects such as nausea and vomiting. Wong and Escayg are now testing whether huperzine A can reduce the frequency of spontaneous seizures in their mouse models. This research was supported by the National Institute of Neurological Disorders and Stroke (R01NS072221, R21NS098776, 2T32NS00748016). Biscayne Pharmaceuticals provided the Escayg laboratory with huperzine A.